As with all my questions relating to Bentham’s life and works my first port of call was the friendly people at the Bentham Project. Their initiative ‘Transcribe Bentham’ is working to publish all of Bentham’s manuscripts and is finding now information all the time. One recent manuscript they sent me is pictured below, and rather wonderfully shows Bentham arguing for the use of gender neutral pronouns. 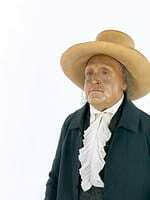 Bentham Manuscript – Courtesy of UCL Special Collections. My last ‘Favourite PanoptiCam Views‘ blog post was way back in June, so an update is long overdue. 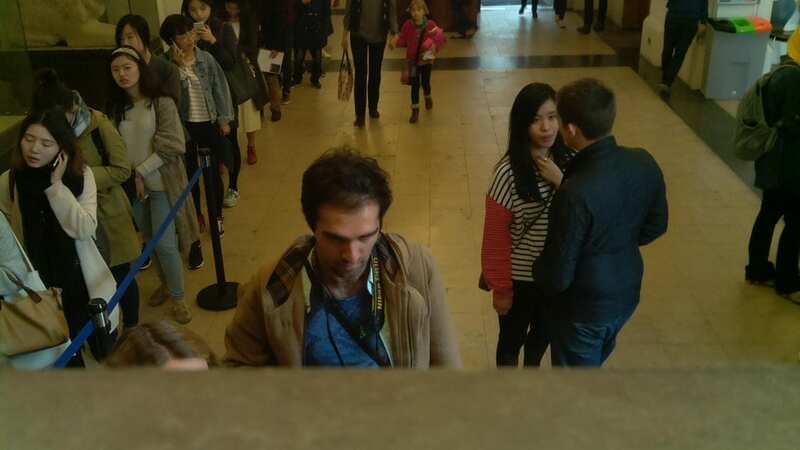 ‘Looking at me, looking at you’ – one regular summer visitor to the auto-icon gets into the spirit of the PanoptiCam Project. 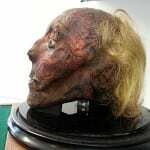 I’ve wanted to write blog specifically about Jeremy Bentham’s head for a while now. ‘Can I see the head?’ is one of the most common questions I get asked. I’m not sure why it has such fascination for people – perhaps as our manager of the Grant Museum recently tweeted when he met him, ‘Face to face with one of the world’s greatest philosophers’, how often do you get to say that? Is it that we want to be able to look someone famous in the face, even if they’re dead? Or is it just that a mummified head is unusual? 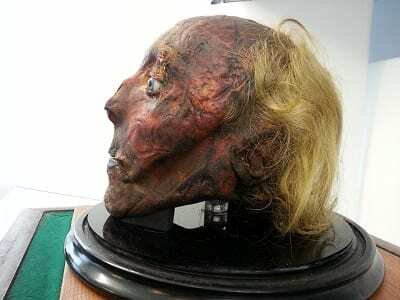 Side view of the head of Jeremy Bentham. Last week Bentham’s head came out from the safe it is usually stored in for a full inspection by one of our conservators, Emilia Kingham. We regularly inspect the head, to ensure it remains stable. 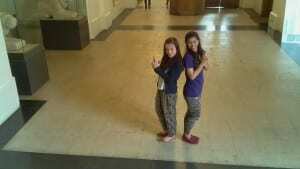 It’s survival for the future is our main concern! The inspection (and Buzzfeed story) generated a lot of interest and questions. For the story Emilia and I were sent a list of questions, which I thought were all very interesting and worth posting on our blog. The answers are from us both. 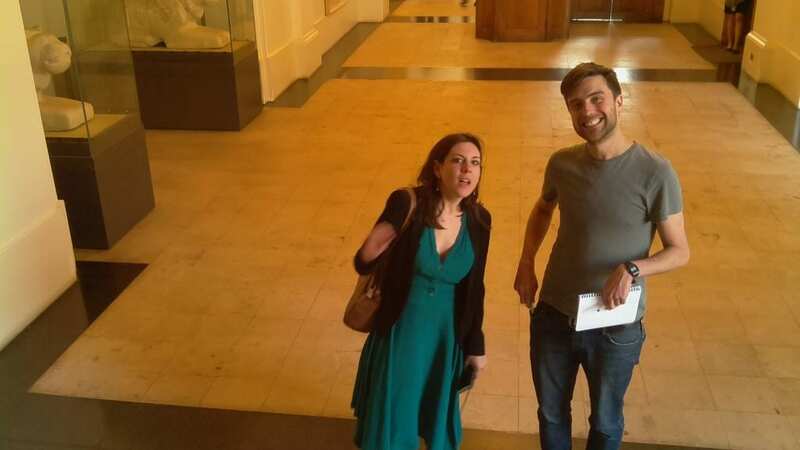 Several months ago saw the launch of the Panopticam Project, a joint UCL Centre for Digital Humanities, UCL Centre for Advanced Spatial Analysis, Bentham Project and UCL Museums project. The Panopticam (see what we did there?) involved the installation of a webcam on top of the auto-icons box to give us a Bentham eyed view of the world. The camera takes a photo every 5 seconds (shown whenever the red light flashes on the camera) which updates the photo on the website here. At the end of each day all the photos are joined together to form a time-lapse recording of the days events, which are made available on YouTube, check out this one from 6 minutes in to see UCL Dance Soc is action. Finally every hour (at 1 minute past) the view is tweeted by @Panopticam. 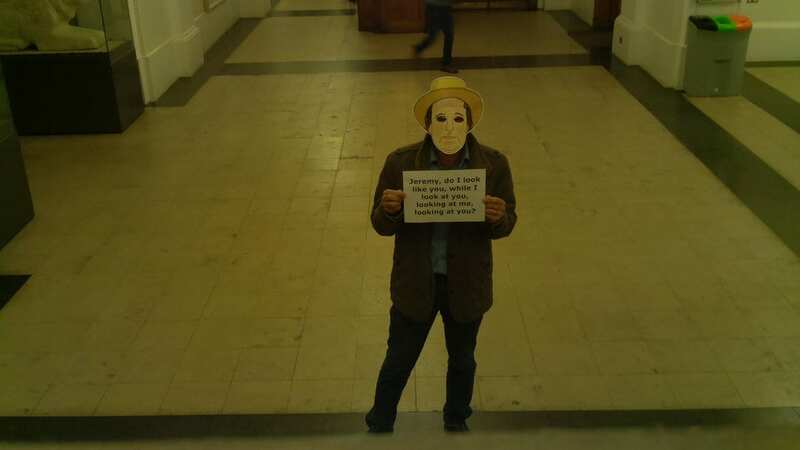 It’s been going for about 3 months now, and recently the project blog decided to show some choice images from the project so far – http://blogs.ucl.ac.uk/panopticam/2015/06/02/some-choice-views-from-bentham/. I thought I’d follow suit and share some of my favourites with you too. 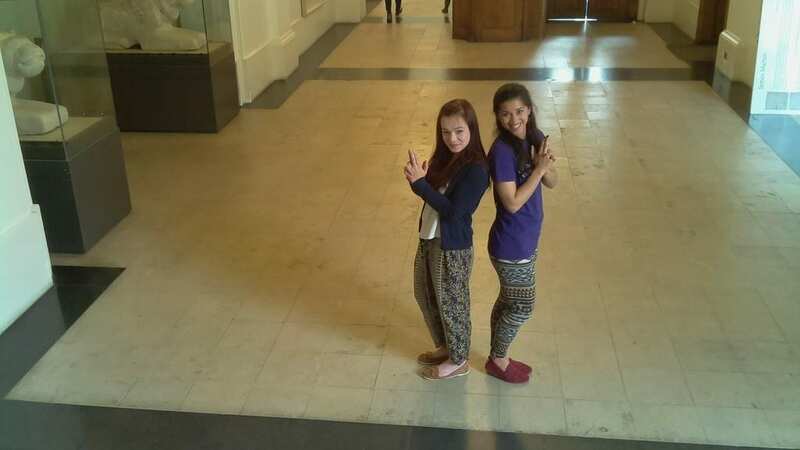 UCL PACE Marketing Manager Meg Dobson and I hard at work. Is the auto-icon wearing underwear? 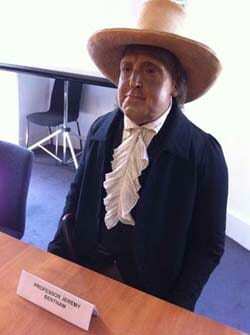 A year or so ago a colleague drew my attention to a Jeremy Bentham related sketch by the ever excellent Horrible Histories BBC programme. Amongst the many Bentham inventions it highlights (including words such as ‘maximise’, ‘minimise’, ‘international’ and appropriately enough ‘eccentric’) was one I’d never heard of before – Jeremy Bentham invented underpants. As you can imagine, this is popular with school groups visiting the auto-icon, and along with his mummified head tends to be the fact school kids remember. 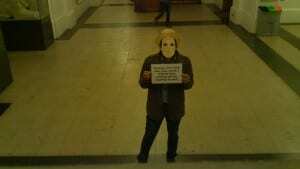 Photo courtesy of UCL Art Museum. 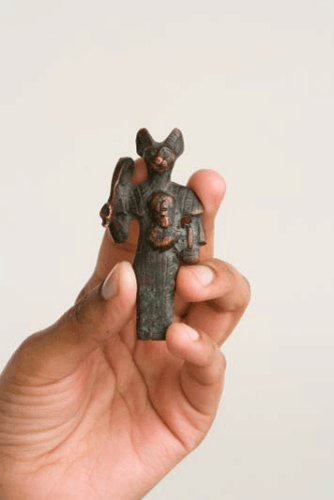 On February 14th (yes, Valentine’s day) I will be giving a short talk at ‘Late London: City of Seduction’, part of the Museum of London’s special events program, on the auto-icon of Jeremy Bentham. I will be introducing the auto-icon, discussing how it was made and talking about some of the legends that have built up around it (head used for a game of football anyone?). I will then relinquish the floor to Professor Philip Schofield, head of the Bentham Project, an expert of Bentham’s life and works. 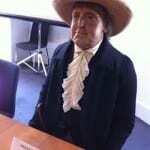 Jeremy Bentham and his new walking stick. From the start of January until the middle of June Jeremy Bentham’s stick is on display in a different part of UCL, in the Octagon Gallery, as part of the ‘Collecting – Knowledge in Motion’ exhibition. While sorting out the paperwork for this in December it struck me just how unfair it was to take an old man’s walking stick away from him for 6 months! After all Bentham had named his stick ‘Dapple’ and so obviously had quite an attachment to it. The least I could do, I thought, would be to find him a suitable replacement.